Day 3 was by far the most difficult hiking I have yet accomplished. 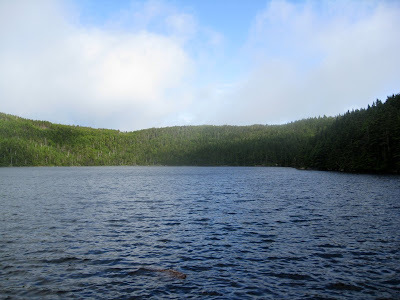 We only hiked about 5 total miles that day (from Speck Pond to the next shelter, Full Goose), but it took the entire day. 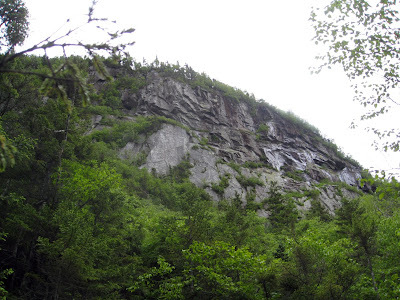 The Mahoosuc Notch is a one mile stretch on the AT that is a boulder pit. 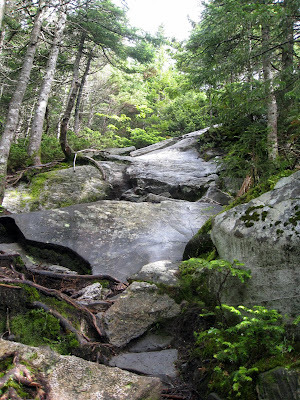 It's considered the most difficult mile on the AT. I think I agree, because it is nothing but extremely large boulders and deep holes. Getting to it is no picnic either...independent of whether you are traveling North on the AT or going South (which is what we were doing). 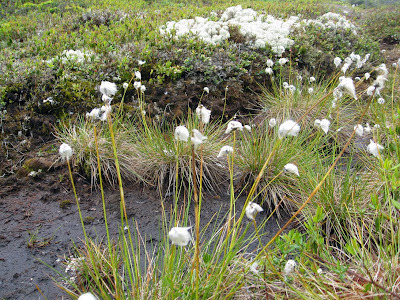 The Notch is in a bowl, and from either direction, you must first travel down to it. 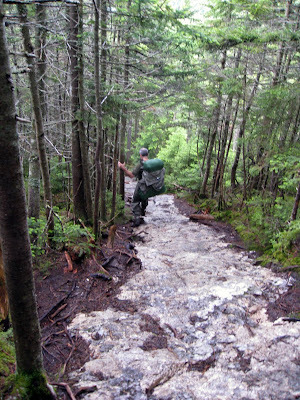 The travel downward is steep, rugged, and rocky....and in our case, wet. We woke on day three to soft rain. And Dave and I stayed in our tent until the rain finished. We were snug and dry inside our tent [the only thing that was the slightest bit damp was my sleeping bag towards the bottom]. The tent fly was wet and wasn't going to dry before we left, so we packed the wet tent up and headed towards the shelter to make breakfast. As we started our hike, the day was looking pretty clear. This next shot is a view of the pond from the other side. 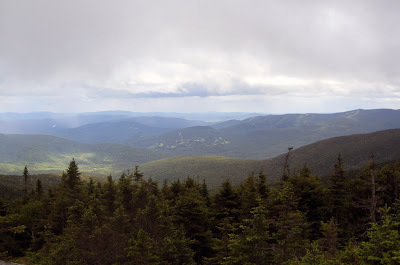 Before we headed into the Notch, we had a little climb up to a nice vista. 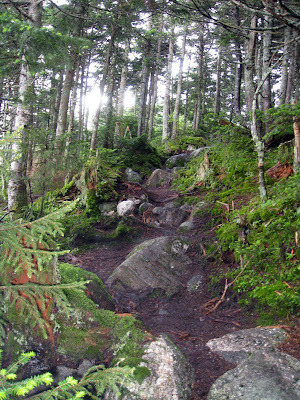 And here's a look at our trail going up! View of the mountains and valleys below. I look pretty weary in the shot...and honestly, I was pretty tired at that point. 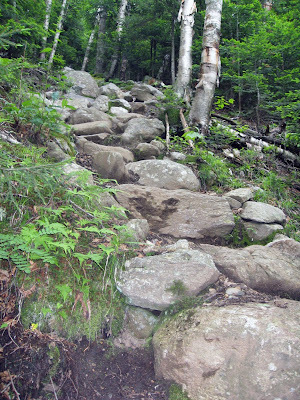 My stepping down legs were still sore from the day before and this terrain only added to the ache! 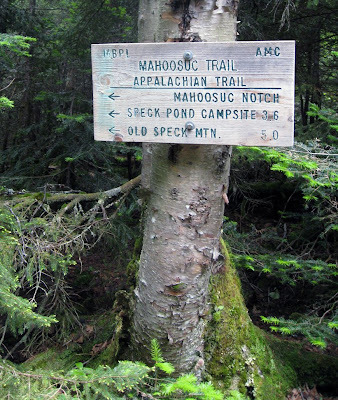 Welcome to the Mahoosuc Notch. 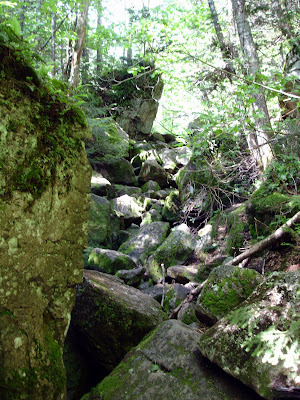 Heading sound, this next picture is the entry way -- you know when you come to it, because there is nothing but large boulders in your way. This next few pictures are from the Notch. 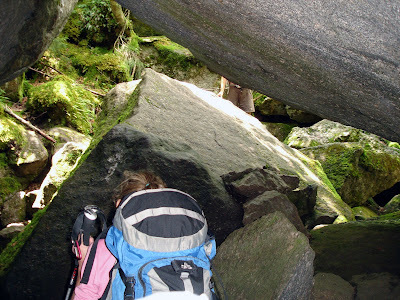 In one, you can see that I was under a boulder and just in front of me, a person heading North on the trail! 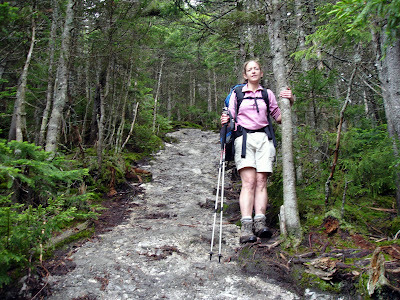 We ran into a few through hikers heading north on the AT. One set of young boys were singing up a storm. I forget what they were singing...but I was smiling, because it was LOUD and SAUCEY. They both looked like they were having the time of their life...and they probably were. Sometimes I wished I had taken time out in my early 20's to do something adventureous like this. 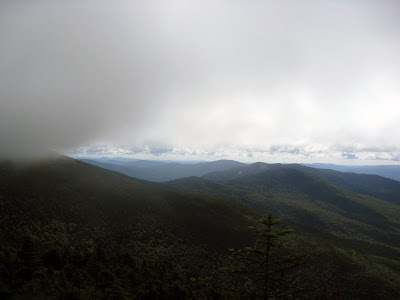 When I was in my engineering classes, I would sometimes dream of hiking the AT. No regrets...I now get to do it in portions! I must admit that traversing the Notch was fun...for a little while. After about 1/2 mile in, I was ready for it to be over. And it was starting to really cloud up. The last thing I wanted to do was get stuck down there, slipping across wet rocks. This next picture is looking up from the bottom. 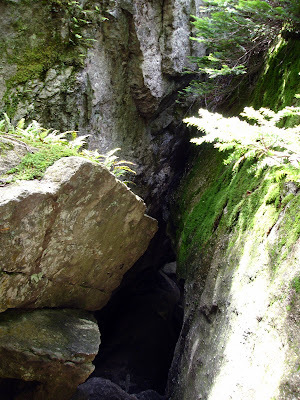 It looked very similar to some of the rock climbing areas we've been to...in particular The Gunks. 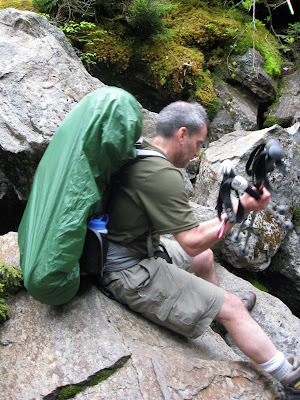 But with the Gunks, you have MUCH easier access. 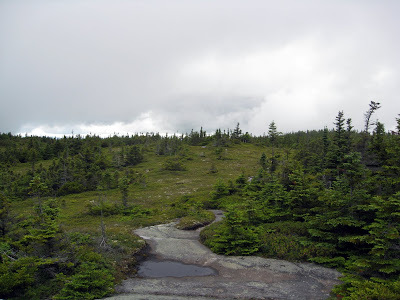 This next picture is the trail post when you enter the Notch heading North. Ahhhh...we were done...with that part. Now, heading back up...across Fulling Mill Mountain (south peak) and to Full Goose Shelter. 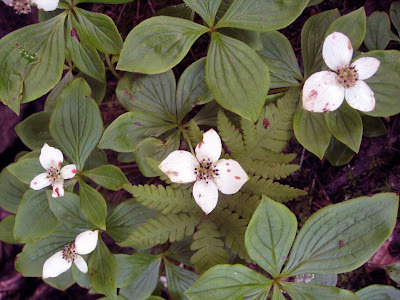 This first picture looks like dogwood, but it was a flower that bloomed among groundcover. 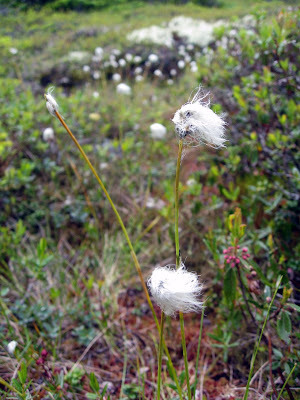 Atop the balds were these flowers that looked like sticks with whispy bits of cotton. In this shot, you can see a ski mountain and resort off in the distance. We made it to the shelter just before it started raining. 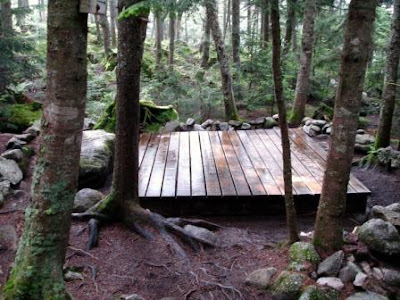 The area was similar to Speck Pond, with a shelter, privy, and platforms for tents. Because our tent was so wet from the previous nights rain, we decided to camp in the shelter. 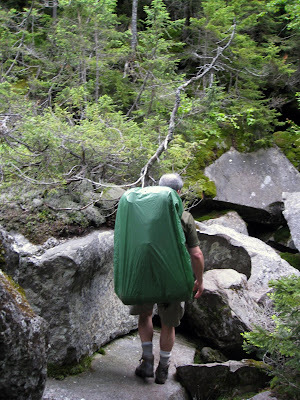 Earl and John hiked together through the Notch and were already in the shelter, setup for the evening. We took a couple spots next to John. We flopped down and rested, then prepared dinner. People started trickling in about an hour after we arrived. And the rain started coming down even harder. Everyone wanted to stay in the shelter...and I didn't blame them. It's NO FUN setting up camp in the rain. We were a full house that night. There were several people that chose to setup tents, because it was so crowded, but we kept making room for as many as we could. Most people were heading south, as we were, and boy did they look weary. There was a couple of older men [they were characters!] 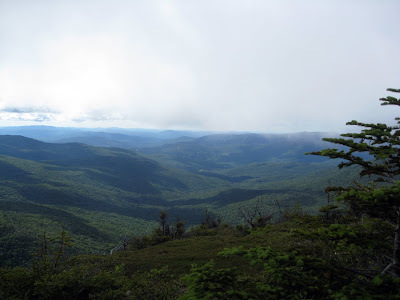 that were section hiking Maine, and they were heading North. I love meeting people hiking on the trail. Most people have really fun stories to share. Most are fun loving characters. Of course, there's a weirdo thrown in once or twice, but I can't really think of more than one occassion where that occurred. I fell asleep before the sun went down! Occassionally people would appear at my feet, because they were making dinner or something and wanted relief from the rain. It hardly phased me! WOW! It's hard to imagine how hard that journey was - those trails look so steep! Beautiful shots of your adventure and a really nice write up! What a time of your life!